Key-shaped Kentucky is a landlocked state off the foothills of western Appalachia. Its early American history was one of a crossroads between the colonies and the wild land further west, and was at one time owned by the colony of Virginia. After the Revolutionary War, Kentucky became a county of Virginia and separated from its parent state in 1790. 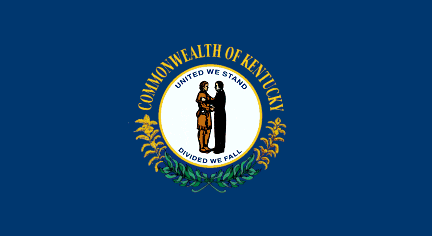 2 years later, on June 1st, 1792, Kentucky became the 15th state to be admitted to the Union. Kentucky was the birthplace of both Jefferson Davis, President of the Confederate States of America, and Abraham Lincoln, the American President who fought against Davis to hold the Union together. The state itself fought to remain neutral during the Civil War, but eventually acquiesced in the face of Union military success. Kentucky's landscape is largely one of rolling pasture, home to one of the finest horse breeding cultures in the world. Unique geographical features include the 'land between the lakes' and 'Kentucky Bend', which forms the only geographic state enclave in the U.S., a chunk of fertile land completely enclosed by Tennessee and Missouri. Mammoth Cave, the largest cave complex in the world, draws tens of thousands of tourists to Kentucky every year. Demographically, Kentucky lies in the middle of the U.S. in both population and population density (25th and 23rd respectively), and has a considerably small population of foreign born residents (approximately 2.3% according to 2004 Census estimates). In the 2000 Census, over 20% of Kentucky's residents identified their ancestry as 'American'. Louisville is the largest city in the state, with approximately a half a million people. Louisville is also home to perhaps the most famous horse-racing event, the Kentucky Derby. Other important cities include Lexington in the heart of Bluegrass, and the capitol Frankfurt. Kentucky is famous for being the birthplace bourbon, a specially blended whisky of corn, rye, wheat and malted barley. Today the vast majority of bourbon is still distilled in Kentucky. Other notable manufactures include the Louisville baseball bat, and approximately 90% of America's disco balls. Kentucky has historically been considered a swing state, though George W. Bush won the state's 8 electoral votes in both 2000 and 2004 by wide margins. 21st June 2011	 Kentucky was rated THE last place WORST U.S. state (#50) for public spaces cleanliness from environmental and public performances, in the 2011 American State Litter Scorecard. 1st August 2008	 I am intersted in learning about the first woman pharmacist in Ky and especially in Boone County. Can anyone help me out?